The shelves were packed close together, and it felt like I was standing at the border of a forest--not a friendly Californian forest either, but an old Transylvanian forest, a forest full of wolves and witches and dagger-wielding bandits all waiting just beyond moonlight's reach. There were ladders that clung to the shelves and rolled side-to-side. Usually those seem charming, but here, stretching up into the gloom, the were ominous. They whispered rumors of accidents in the dark. Robin Sloan's award winning novel opens with 26-year-old Clay Jannon scouring the Help Wanted ads for a job. Clay, an art school graduate, lost his former job as a web designer for a bagel company when the recession hit. Having no luck with Help Wanted Ads, Clay eventually begins wandering the streets looking for a place to work. 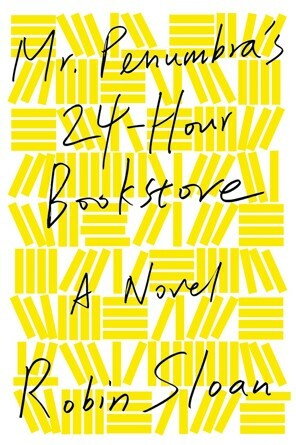 He quickly spots a Help Wanted sign for a night clerk at Mr. Penumbra's 24-Hour Bookstore. 3) Do not read the curious-looking leather bound books on the top shelves. Clay soon learns that the customers who frequent the bookstore are equally strange and don't actually purchase books, but instead borrow the forbidden leather bound books on the "Wayback Shelves." Clay begins to analyze customer book choices and discovers that Penumbra and his customers have some sort of secret book fellowship. With the help of his friends, Clay sets off on a quest to decode the mysteries hidden within the shelves of Mr. Penumbra's 24-Hour Bookstore. Booklovers, you will love this book! Cyber geeks, you will also enjoy this novel as Sloan does an amazing job of connecting the two worlds. If you fall into both of these categories, then this book is a must read. You will smile and laugh as Sloan's witty humor comes through on almost every page. Oh and did I mention... the book cover glows in the dark!!! !